Veterans Day is November 11th so it’s time to begin planning for this special holiday. Below are a few resources you might want to include in your plans this year. Many businesses show their support for veterans by offering discounts and freebies for veterans on Veterans Day. You can read more about that by clicking HERE. I have something free to give to you, too. My friend, Fern, also has a freebie for you. Click HERE to download Fern’s freebie. 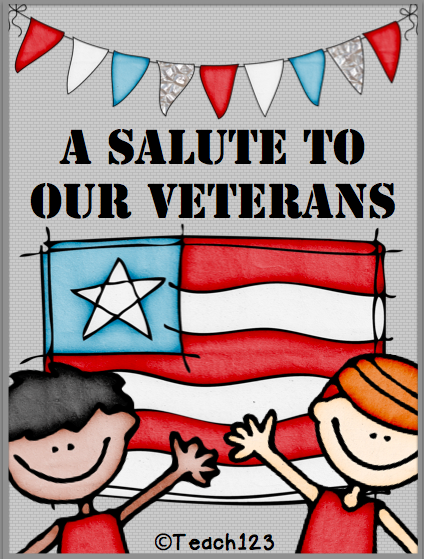 Are you looking for more Veterans Day materials? I also have this Sentence Shuffle Center that works great as a literacy center, file folder game, or an activity for those students who finish with their work early. What a great collection of Veterans Day ideas! Hi! My husband is in the military and has been deployed to Iraq several times. Hi! My husband is a retired soldier. He served 23 years and served in Iraq before retiring in 2006. I am a Fort Bragg teacher, and I love serving our military families! Hi! My husband is a retired veteran. He served 23 years active duty an retired in 2006. I currently teach on Fort Bragg and really enjoy serving and teaching our military children. Hi! My husband is retired military. He served 23 years including a tour in Iraq. I am a teacher on Fort Bragg. I really enjoy serving our military families. My husband is also in the military and has been deployed to Iraq 2 times and is in the process of getting ready to go to Afghanistan next year. Retired after 20 years and 4 days -While I didn't enjoy being away from family, I did like getting to see the world. Thank you so much!!! 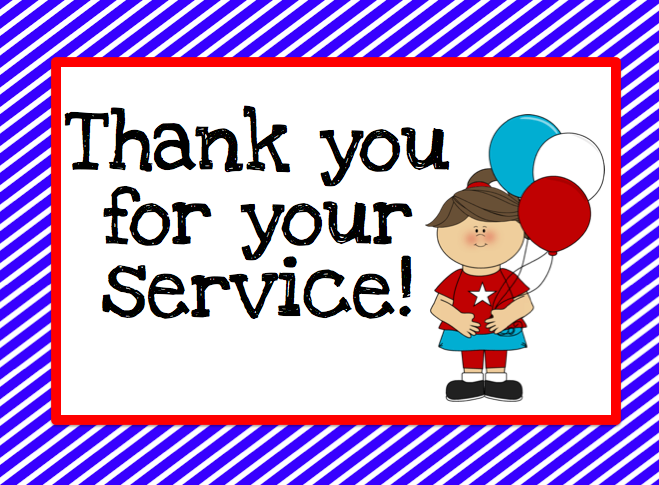 Military families do give up so much – holidays, births, family nearby – thanks for acknowledging! My husband is currently in the military (Air Force)…he has been in 22 years (we have been married 20 of those years)…my husband's squadron is a deployment unit. My father was also in the Air Force for 24 years and both my paternal grandmother and grandfather were in the Army for WWII and my maternal grandfather. My brother was also in the Army…lol I guess you could say I come from a long line of a military family. Thank you for offering such a great package! That is really kind and generous of you!!! My husband returned home on Halloween after 8 months! I am a homeschooling mom of 4 (ages 13 yrs, 9 yrs, 6 yrs, and 11 months!). Thank you for this special packet! Fantastic post with so many ideas! Thanks! My husband and I are both veterans of the U.S. Army. I served 4 years active duty as a medic. He served 8 years active duty and was in the first war in Iraq (Desert Storm). My husband and I are both U.S. Army veterans. I served 4 years active duty as a medic.My husband served 8 years active duty and was in the first war in Iraq (Desert Storm). We met on a training exercise while stationed in Germany. My dad was a Marine Drill Instructor. He even has a brick dedicated to him at the Marine Corps Museum at Quantico. My husband is currently serving in the military. My husband is retired after 26+ years active duty in the World's greatest Navy! Thank you for this offer. My husband is currently in the military. What a great thing you are doing! My husband served in the Marine Corps. and being the good solider he is, has decided to re-enlist! Mu husband is a retired veteran after serving 20 years with the Army National Guard. I am always looking for good material to teach my children (we homeschool)about veteran's day. Thanks so much! My husband is a retired veteran after serving 20 years. We homeschool our children and this packet is much appreciated. Thanks! This is really awesome! 🙂 My husband is an US Army veteran. Hi, Thank you so much for thinking of our veterans and their families. My Husband, Erasmo Rodriguez, is a US Army Veteran. He served at Fort Stewart as an M1-A1 tanker and was deployed in Operation Iraqi Freedom. My husband, Lester Reece served as a Marine. He continues to have a deep love of country and all armed services. Hi-What a great idea! Thanks for showing your appreciation for the military. My husband SSG Alphonso Brown retired from the Army after serving for 20 years. Thank you so much for gathering all of these ideas in one place to share with other teachers. My father in law, Vidal Heredia, served in the United States Army during the Vietnam war.